With each passing season, statistical analysis is playing an ever-increasing role in how hockey is played and covered. 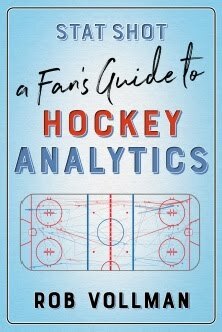 Acting as an invaluable supplement to traditional analysis, Stat Shot: A Fan’s Guide to Hockey Analytics (ECW Press, September 2018) can be used to gain insight into what teams are doing behind the scenes — or maybe what they should be doing! Inspired by Bill James’s Baseball Abstract, Rob Vollman has written a timeless reference of the mainstream applications and limitations of hockey analytics. With over 300 pages of fresh analysis, it includes a guide to the basics, how to place stats into context, how to translate data from one league to another, the most comprehensive glossary of hockey statistics, and more. ROB VOLLMAN is the co-author of all six Hockey Prospectus books and two McKeen’s magazines and is the author of four books in his own Bill James–inspired Hockey Abstract series, including the highly popular 2016 book, Stat Shot. Rob is one of the field’s most trusted and entertaining voices, and he has helped bring what was once a niche hobby into the mainstream. He lives in Calgary, Alberta.